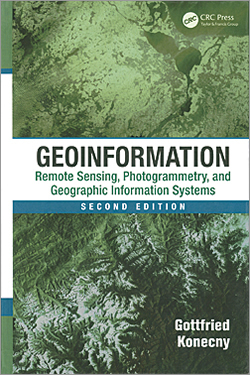 Gottfried Konecny gives readers a comprehensive overview of the evolving field of geoinformation in Geoinformation: Remote Sensing, Photogrammetry, and Geographic Information Systems, Second Edition. This book recognizes the transformation of the discipline-oriented technologies of geodesy, surveying, photogrammetry, and cartography into the "methodology-oriented integrated discipline of geoinformation." 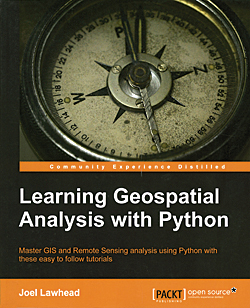 This book is predicated on a Python-centric approach to the use of Python with GIS as one of the components of its focus on geospatial analysis. This hands-on guide to geospatial analysis assumes basic proficiency with Python. It teaches the reader how to use Python to construct applications as well as use it with GIS software packages including ArcGIS. The author, Joel Lawhead, posits several reasons for performing geospatial tasks with Python. These include having complete control of the underlying algorithms, data, and execution; minimizing overhead when performing specific, repetitive analyses; creating programs that are easily shared; and—possibly the most compelling for GIS practioners—obtaining a more profound understanding of geospatial analysis. Of special interest are Chapter 4, which introduces Python libraries for working with geospatial data; Chapter 8 on advanced geospatial Python modeling; and Chapter 9 on using real-time data.